Hezbollah Saves Iranian Base in Syria; Is Assad Preparing for Chemical Warfare? 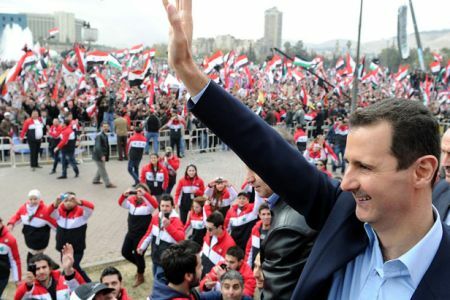 It’s not exactly a sign of strength when a dictator is found trying to import chemical weapons ingredients and has to rely upon a foreign terrorist group to fight a small group of protesters. A senior official in the Iranian Revolutionary Guards says that Hezbollah sprung into action to save an Iranian base in Syria from being overrun by protesters and presumably, the rebel forces called the Free Syria Army. The base is located in Madaya in Zabadani, which fell to the rebels last week. The official claimed that Iran and Syria is working with Russia and China to “deter” foreign powers from intervening and that Russia has sent ships including aircraft carriers to protect the country. A Lebanese opposition figure claims that Assad even relies upon Hezbollah for personal security and the staging of pro-regime rallies. He said that over 200 cars and one bus arrived in Syria from Hezbollah-controlled Lebanon to take part in a rally in Damascus. When Assad appeared in Umayyad Square, Hariri says, he was guarded by Hezbollah terrorists. He also noted that Assad only appeared for three minutes, indicating it was a staged event. In a worrisome sign that Assad may be preparing to use chemical weapons, it has come out in the Turkish press that four Iranian trucks intercepted on their way to Syria two weeks ago contained WMD-related materials. One truck had components for ballistic missiles and the other three had 66 tons of sodium sulfate, used in the production of chemical weapons. The Free Syria Army’s winning streak is continuing. It is still holding onto Douma, a suburb of Damascus. There are contradictory reports as to whether they captured parts of the city or the entire city. The Syrian Observatory for Human Rights says the regime’s forces retreated to two sites, abandoning Douma. That would make it the second city to fall to the FSA in one week. Douma is only 20 kilometers southeast of the capital. Over 150,000 people attended funerals for civilians killed there today. Syrian dissident Ammar Abdulhamid also reported fighting in Aleppo Province, specifically in Managh. There is also video of FSA members openly marching today in Kufrbutna, a neighborhood of Damascus.